Today’s question is: What do you do that makes your auction different from every other benefit auction in your city? Is that chirping crickets I hear? If you’re stumped by the question, I’m not surprised. We planners get into ruts, doing the same thing all the time. Unless you’re traveling the world attending auction galas, it’s almost impossible to get exposed to fresh concepts. This leads me to why late last year I launched the Great American Benefit Auction Roadshow. It’s where I preach my own version of benefit auction gospel. As time allows, I’ve been squeezing in workshops. Chicago, Cincinnati, and Honolulu were the first to roll out, and now I’ll be in Louisville, KY sharing my Better Benefit Auctions workshop on Thursday, July 10, 2014. You’ll learn why your auction isn’t cutting the mustard and WHAT TO CHANGE. 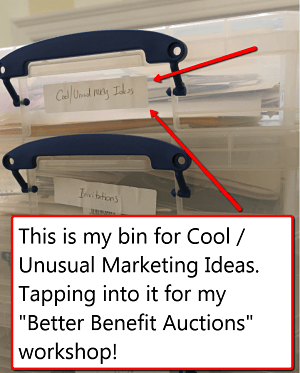 Better Benefit Auctions: How to create your own high performing, distinctive auction using PROVEN strategies that don’t break the bank. Click for details on Better Benefit Auctions. Let’s face it … you spend so much time setting up this darn auction, you really should MAXIMIZE YOUR AUCTION’S VALUE. You want it to be unique, profitable and fun….. Frankly, a number of these benefit auction ideas I’ve never taught before, anywhere. Are you within driving distance of Louisville? I’m inviting you to be part of the action. The venerable Presentation Academy (centrally located in downtown Louisville) will play host. Full details on parking, food, and other particulars are available once you register. Learn more about Better Benefit Auctions here.